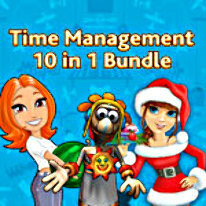 Master the art of Time Management in this amazing collection of titles together for the first time! Amelie's Cafe- Create Amelie's Cafe - the hippest hangout in town - as you feed the famished masses! Amelie's Cafe: Halloween- Keep the cooks busy making brain pie and witch's brew, and rack up big money on 50 fast-paced levels.! Amelie's Cafe: Holiday Spirit- Decorate and upgrade three Christmas cafés, prepare a variety of yuletide favorites for your guests, and earn enough money! Amelie's Cafe: Summer Time- Help Amelie cater to a variety of guests, keep her cooks busy, and rack up big money. Aztec Tribe- Build the Aztec civilization by mining resources and constructing buildings in Aztec Tribe. Aztec Tribe: New Land- Packed with challenges and rewards, Aztec Tribe: New Land is a village builders dream come true! My Farm Life- Plant and harvest crops, milk cows, and purchase equipment to produce the goods your customers want! My Farm Life 2- Help Lisa tackle the unique challenges of running a rooftop farm! Rescue Team- Control the rescue workers who are rebuilding three islands in the wake of devastating weather! Rescue Team 2- When disaster strikes, the Rescue Team sweeps in to save the day.